The Hydrological Services Tipping Bucket Raingauge is recognised as the world standard for measuring rainfall and precipitation in remote and unattended locations. The integrated syphon mechanism delivers high levels of accuracy across a broad range of rainfall intensities. 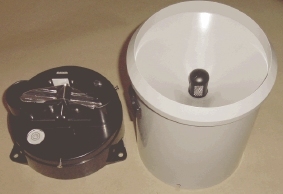 Each unit consists of a collector funnel with Leaf filter, an integrated syphon control mechanism, an outer enclosure with quick release fasteners, and base which houses the tipping bucket mechanism. The unit includes dual output reed switches with varistor protection as well as dual rainfall discharge outlets for water collection and/or analysis. The bucket tips when precipitation of 0.01 inch, 0.2mm or 0.5mm has been collected. Each tip activates a reed switch closure which is detected by a Data Logger and/or Telemetry System. The Tipping Bucket Raingauge can be used in conjunction with Hydrological Services data logger model RRDL3. The logger is rugged and compact, it records the date and time of occurrence of tips from the raingauge up to 55,000 events can be stored in the RRDL3's memory. The data is stored in a flash EPROM. The RRDL3 fits inside the TB4 Raingauge. Its compact design makes it ideal for incorporation into any piece of equipment where intelligent data acquisition and logging are required.